Kalil Branham – WR – Columbus (OH) Northland: Branham is committed to Michigan (LINK). Maliq Carr – TE – Oak Park (MI) Oak Park: Carr is a 6’6″, 215 lb. prospect with offers from Michigan, Notre Dame, Ohio State, and Penn State, among others. He’s a 3-star, the #75 wide receiver, and #414 overall. Only two crystal ball picks have come in so far, one for OSU and one for Notre Dame. He wants to play wide receiver in college, but his body may necessitate a move to tight end. Deontae Craig – DE – Fort Wayne (IN) Culver: Craig is a 6’4″, 230 lb. prospect with offers from Indiana, Northwestern, Notre Dame, and Ohio State, among others. He’s a 3-star, the #25 strongside end, and #522 overall. Miles Fleming – WR – Columbus (OH) Bishop Hartley: Fleming is a 6’0″, 175 lb. prospect with offers from a few MAC programs. He’s a 247 Sports 3-star, the #74 athlete, and #892 overall. He plays quarterback in high school but will probably be a wide receiver or safety in college. Drake Heismeyer – OG – St. Charles (MO) Francis Howell: Heismeyer is a 6’3″, 283 lb. prospect with offers from Indiana, Iowa State, and Missouri, among others. He’s a 3-star, the #27 offensive guard, and #705 overall. He visited Michigan last weekend, but I didn’t find out about it until afterward. Devin Hightower – LB – Akron (OH) Hoban: Hightower is a 6’2″, 205 lb. prospect with offers from Cincinnati, Iowa, and Michigan, along with a few MAC schools. He transferred from Lakewood (OH) St. Edward after his junior season. Theo Johnson – TE – Windsor (Ontario) Holy Names: Johnson is a 6’5″, 235-pounder with offers from Georgia, Iowa, Michigan, and Penn State, among others. He’s a 4-star, the #7 tight end, and #312 overall. His crystal balls are all for Penn State right now. 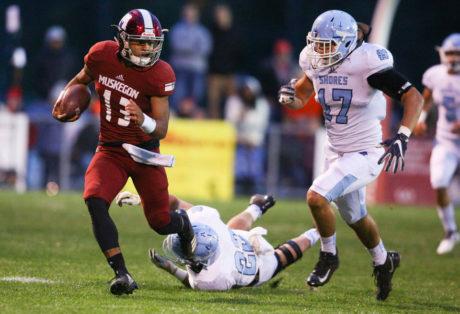 Cameron Martinez – WR – Muskegon (MI) Muskegon: Martinez is a 5’11”, 175 lb. prospect with offers from Michigan, Michigan State, Ohio State, and several others. He’s a 3-star, the #43 athlete, and #515 overall. Though he plays some QB at Muskegon, he is likely to be a receiver or defensive back if he comes to Michigan. His crystal ball is 100% on Michigan. 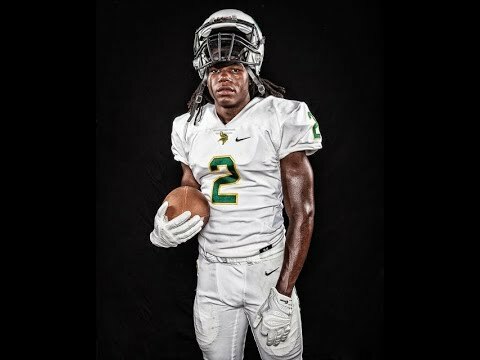 Kindel Richardson – CB – Canton (OH) GlenOak: Richardson is a 5’11”, 175 lb. prospect with a lone offer from Michigan. Justin Rogers – OG – Oak Park (MI) Oak Park: Rogers is a 6’2″, 311 lb. 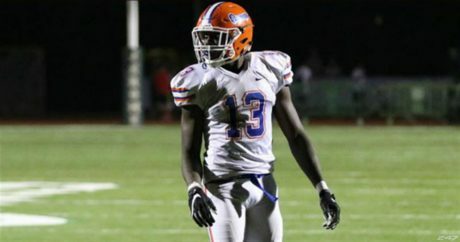 prospect with offers from Alabama, Georgia, Michigan, and Ohio State, among others. He’s a 5-star, the #1 offensive guard, and #17 overall. He has 53% of his crystal balls for Ohio State and the other 47% for Georgia, but he has visited Michigan a lot lately, including last weekend. Branson Taylor – OT – Elyria (OH) Catholic: Taylor is a 6’6″, 290-pounder with offers from Cincinnati, Indiana, Pitt, and Purdue, among others. He’s a 247 Sports 3-star, the #71 offensive tackle, and #670 overall. Jaheim Thomas – LB – Cincinnati (OH) Princeton: Thomas isa 6’5″, 215 lb. prospect with offers from Michigan, Michigan State, and Wisconsin, among others. He’s a 4-star, the #17 outside linebacker, and #253 overall, although with his size, I think he will probably end up at defensive end in college. Drapher Cribbs – RB – Kentwood (MI) East Kentwood: Cribbs is a 6’2″, 210 lb. prospect with no offers right now. 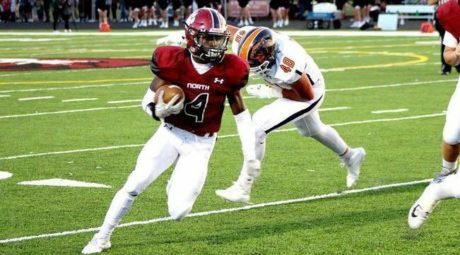 He played for a very talented East Kentwood team in 2018, so he didn’t get a chance to shine on offense, but he is expected to be a solid prospect. 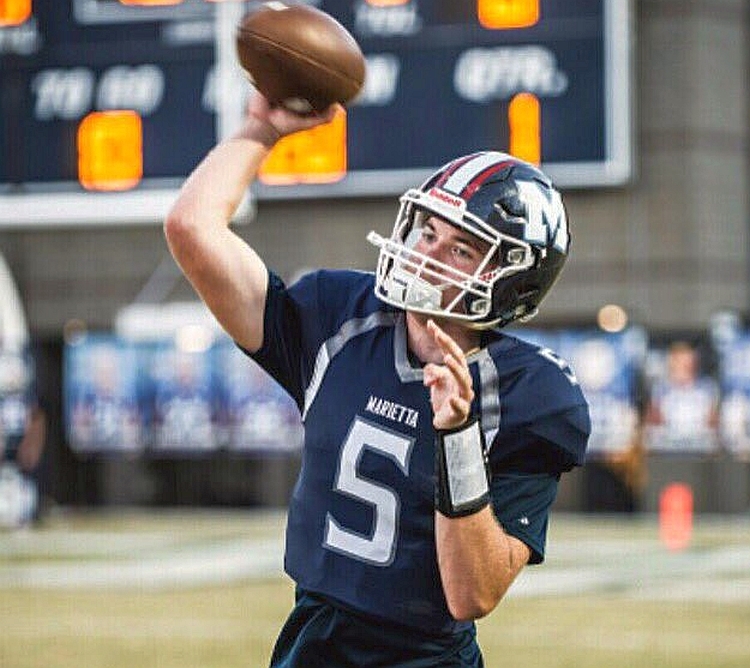 Branden Miller – QB – Kentwood (MI) East Kentwood: Miller is a 6’4″, 175-pounder with no offers at this time. Will Johnson – CB – Groose Pointe (MI) South: Johnson is a 6’1″, 180 lb. prospect with offers from Kentucky, Michigan, Michigan State, and Penn State, among others. 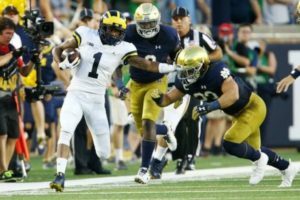 He’s a Michigan legacy, as his father Deon was a defensive back for the Wolverines in the early 1990s. Myles Rowser – S – Belleville (MI) Belleville: Rowser is a 5’10”, 175 lb. prospect with offers from Central Michigan, Michigan, Michigan State, and Western Michigan. He’s the younger brother of 2020 Michigan commit Andre Seldon. Leonard Henry – LB – Grand Blanc (MI) Grand Blanc: Henry is a 6’4″, 210 lb. prospect with an offer from Cincinnati. Hit the jump for some more visitors from the 2020 and 2021 classes.